The "Georgia O'Keefe: Abstraction" exhibition at the Whitney Museum of American Art in New York City elevates to the forefront the Georgia O'Keefe I fell in love with years ago while immersing myself in my father's comprehensive Georgia O'Keefe coffee-table catalog. At that time, at the age of 8 or 9, I knew little about O'Keefe's legacies as an iconic feminist southwestern hermit or as a painter of female sexuality. I knew only the gravity of the images she created, especially in the 19-teens and 20s. This gravity is, of course, magnified a thousand-fold by experiencing O'Keefe's paintings in proximity. Each linen or canvas, water-color or oil is a world with its own modality. 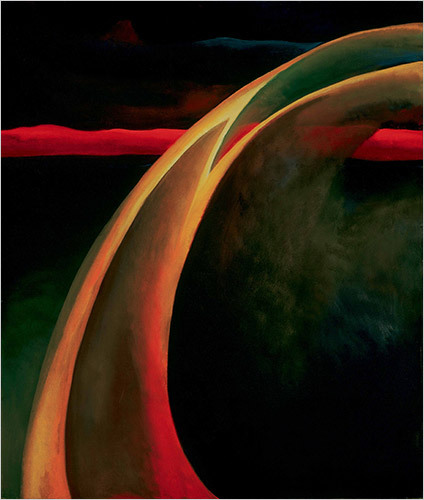 O'Keefe's paintings get at the heart of abstraction, its ability to access the recesses of our metaphorical minds. Even with an excellent audio guide, this exhibit was alive with conversation, with multi-generational sketchers and with people palpably experiencing art. Remarkably, around noon on a Saturday, it was not over-crowded. Beautifully curated, this exhibit focuses attention on the art itself, but also on the power of re-encounter and context. I think even Georgia would have enjoyed it. A quick note on TKTS-- I had not waited in Broadway's signature cue since its makeover in the early 2000s. The new TKTS is well-managed and provides a mostly logical user-experience while advertising itself with a unique cascade of stadium seating in the heart of Times Square. The only kink that still needs straightening is egress from the line once a ticket is purchased. Luckily, crowd marshals are on hand to raise the velvet rope for those unable to duck beneath it. My trip home from the fair state of Michigan was capped by a visit to the Michener Museum in Doylestown, PA to see the Smithsonian SITES and Jim Henson Legacy Foundation's traveling muppet exhibit, Jim Henson's Fantastic World. I was so excited to see Jim Henson's sketches and the genuine muppets (Rowlf, Kermit, Fraggles and more!) in cases that I was able to forgive the slightly chaotic organization of the exhibition. Roughly chronological, but also thematic, the exhibit explores Henson's career, focusing on Sessamee Street, Henson's film career, the Muppet Show and Henson's early work with commercials that led to many of his educational breakthroughs. The documents and artifacts in this exhibit are a real treasure and the exhibit text is written at a simple enough level for children of all ages. This exhibit is worth seeing just for the obvious joy felt by everyone encountering Jim Henson's legacy. I would be interested to see how the exhibit works in different spaces as it travels around the country. The one thing I think the exhibit program could probably use is more extensive merchandising, especially if tee-shirts were available where proceeds would go to benefit educational charities... At least I was able to purchase a muppet for my husband-- Fizzgig from Henson's The Dark Crystal.